Bluetooth quality from the Casio G'zOne was just fine, but not great. I was able to connect my headset for calls, but reception dipped frequently, and voices cut in and out during calls. The phone worked fine with my stereo Bluetooth speakers, and reception was much better for music than it was for calling. I was also able to send a file to my laptop using the Bluetooth connection with no trouble. The external display does some of its best work when it's telling the time. It's fast and easy to check the hour on the monochrome screen. Flip open the phone and you'll find a clock on the standby screen, with a few different style options and sizes available. One of these is sure to fit your needs. 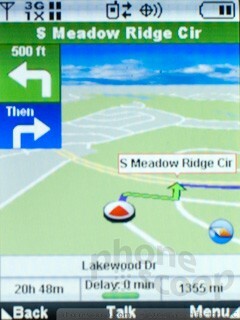 Navigation on the Casio G'zOne Ravine is provided by VZ Navigator. I was pleased to find a recent build of the navigation software on this phone. VZ Navigator did a fine job guiding me through my treks on the unnamed country roads around my town. The phone found my position quickly, even when I started my trip indoors. 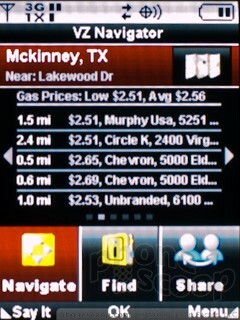 The GPS also worked well with the G'zOne Gear apps, like the star map. 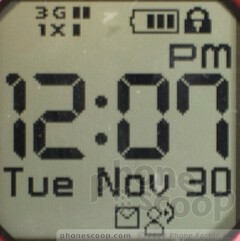 I was disappointed that VZ Navigator did not take advantage of the external display. The display indicated that VZ Navigator was open, but it did not offer even simple turn arrows. At least the phone could blare the spoken directions over the blisteringly loud speaker. One problem, though, was that the VZ Navigator app did not turn down the volume when I pressed the volume keys. Instead, it opened a navigation volume menu, adding unnecessary steps. If you're trying not to disturb the baby sleeping in the back seat, this is a real hassle.